Before joining the UT PGE faculty in August of 2014, Dr. Foster was most recently a faculty member at UTSA and prior to that was a senior member of the technical staff at Sandia National Laboratories where he worked for seven years. 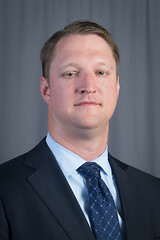 His research interests are in experimental and computational geomechanics and multi-scale modeling with applications to well completions, lost circulation, hydraulic fracturing, and anomalous flow in porous media. Additionally, he has interest in fundamental theoretical advancement of the peridynamic theory of solid mechanics. H. Ouchi, J.R. York, A. Katiyar, J.T. Foster, and M.M. Sharma. A peridynamics model of fully-coupled porous flow and geomechanics for hydraulic fracturing. Computational Mechanics, Accepted. doi:10.1007/s00466-015-1123-8. M. Bessa, J.T. Foster, T. Belytschko, and W.K. Liu. A meshfree unification: Reproducing kernel peridynamics. Computational Mechanics, 53(6):1251–1264, 2014. doi:10.1007/s00466-013-0969-x. A. Katiyar, J.T. Foster, H. Ouchi, and M.M. Sharma. A peridynamic formulation of pressure driven convective fluid transport in porous media. Journal of Computational Physics, 261:209–229, March 2014. doi:10.1016/j.jcp.2013.12.039.